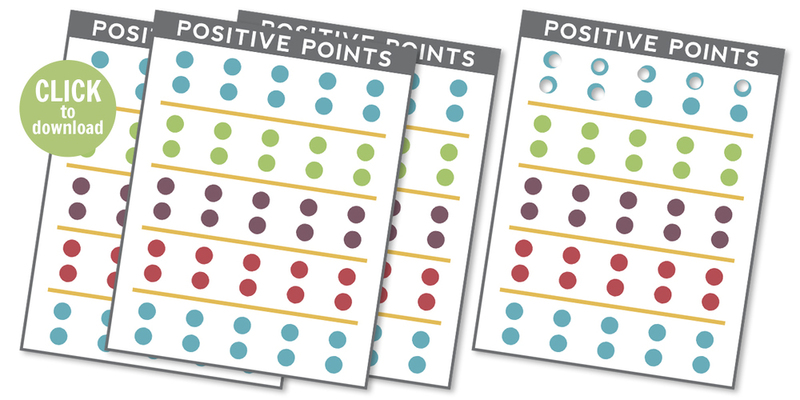 Download the free positive points printable here. Having recently moved to Colorado, everything is new for our kids. They are happy kids in general, but change isn't easy for anyone. As our kids are adjusting to their new school, we've been trying a fun thing we call "Positive Points." Each day, the kids can earn up to ten points for listing good things. Anything they enjoyed, they thought was fun, that made them happy, counts for a point. When they reach ten points, they get a small treat. Little things such as stickers, or a marshmallow, or some craisins are popular rewards. When a punch card is completely full, we take a trip to the dollar store where the kids were allowed to select one prize each. For our first trip, we came home with a whoopy cushion, candy, and fairy wings. I was surprised how successful our game was at helping the kids learn about positive attitudes. By the end of the week, they were reminding each other to "take the positive view" and look for blessings. It worked well for school drop-off time, homework time, or any time someone started getting glum. After listing a few happy things from the day, the kids usually forgot they were complaining because they had launched into a fun story. Although we intended this to be a kid game, it really could be fun for adult attitude adjustments, too. Don't you think? You could always reward grouchy coworkers with treats for their efforts to get beyond anxiety. Why not? I may just reward myself with positive points for doing dishes or laundry with a smile. In the mountains, flowers grow in the craziest spots. They might be right in a pathway, or in between rocks. Their situations might not be what you would consider ideal, and yet they bloom.